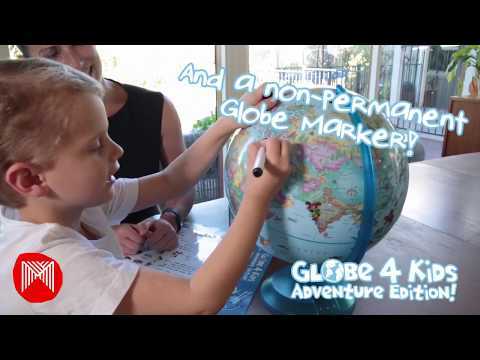 Micador | Globe4Kids - Blue Ocean, 30cm Adventure Edition Micador jR.
Home // Globes and Maps // Globe4Kids - Blue Ocean, 30cm Adventure Edition Micador jR.
Includes learning activity sheet, easy to peel and replace stickers and non-permanent globe marker. More than 100 illustrations of animals, monuments, produce and more. Easy to assemble. Includes easy-to-follow instructions. Huge 30cm diameter globe sphere with lots of fun things to learn and do! 4.833333333333333 out of 5 based on 3 user reviews. The Micador jR. Globe4Kids comes with a double-sided activity sheet. My 6 year old and I love working out locations of things on the sheet using the longitude & latitude lines. The sheet also contains amazing facts and interesting stats: and they really ARE amazing! It’s perfect for kids to explore and learn about our planet in a fun and creative way. A really fantastic educational device: a must have in every home! An interesting way to learn about the world around us. The globe makes it easier than a map to understand. Good for preschool ages as well. My kids LOVED the stickers that came with the globe4kids and spent ages doing the activities. An erasable marker is included which was great for making tracks to the different places we are travelling to this year (be sure to wipe off the marker after each use, as keeping the ink on the globe for longer periods of time can leave a faint mark). This activity is a great introduction to geography for your child. Use the graphics on the globe to talk ab... Read more.